Here is my second holiday look for you. 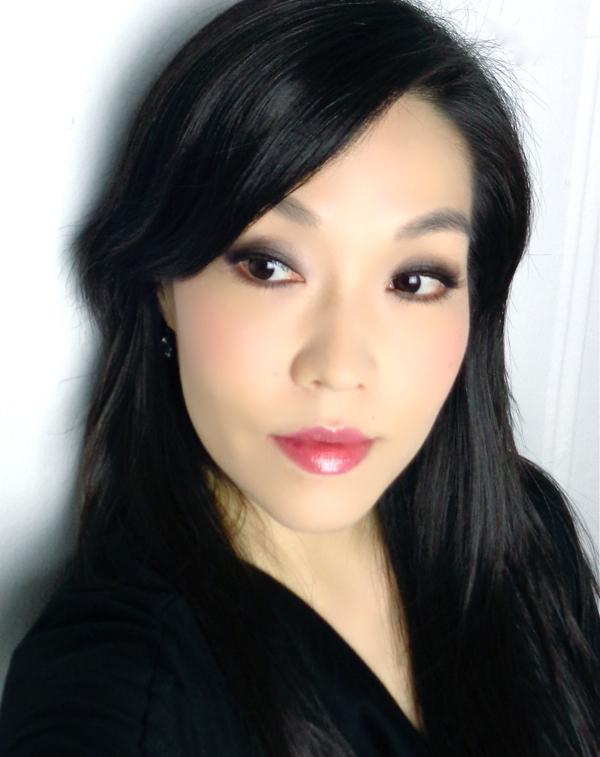 I wanted a sweet "barbie" like look using lots of pink, but also aimed it to be more age-appropriate and refined. 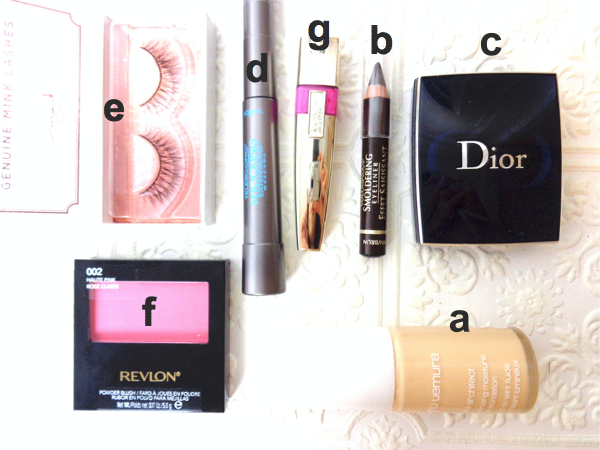 In fact, I wouldn't say this is much different from my everyday looks except that I added a pair of mink eyelashes. Shu Uemura Face Architect Illuminating Foundation 784 (a) was applied using a foundation brush to ensure a luminous and bright complexion. 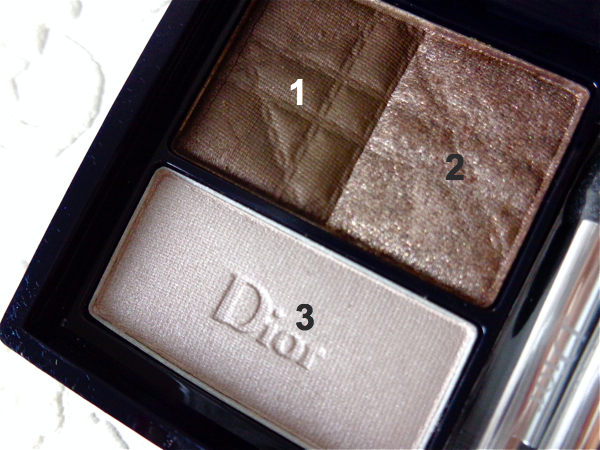 For the eyes, I used L'Oreal Voluminous Smoldering Liner in Brown (b) first to base the eyeshadows, then applied all three colors from Dior Smoky Brown Trio (c). The deep chocolate brown color (1) was packed on the folds to set the lined area. I used the shimmery taupe brown (2) all over blending out the harsh edges. The lightest satin ivory (3) is actually meant to be used as base, but I used it on the inner corners to highlight. For the lashes, both mascara and falsies were used. I mean, what's a barbie without luscious lashes? L'Oreal Telescopic Shocking Extension waterproof mascara Blackest Black (d) was applied first followed by a pair of mink eyelashes (e). For pink lips and cheeks, L'Oreal Wet Shine Stain Pink Rebellion (g) and Revlon Powder Blush Haute Pink (f) were used. 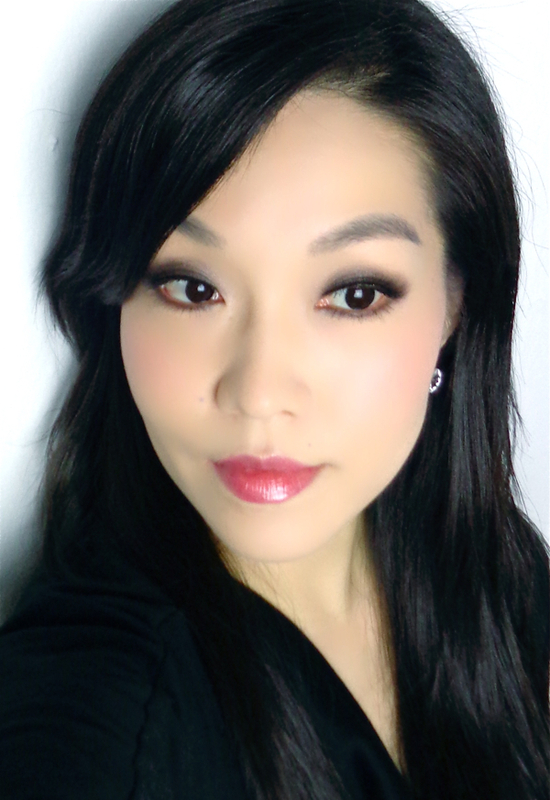 Approached slightly differently from my last look since I stayed in my comfort zone - taupe and pink, but it is still in the same effort to convert everyday face into a holiday look. It took a few more steps involving false lash application and an extra tool (I mean, the foundation brush), but that was special enough for the holidays while allowing me to feel not so out-of-place nor juvenile. I had a very relaxing Christmas and ate lots of good Korean food. ohhh you look fab here, definitely a soft barbie look! have a great weekend!